Hollywood, Oct.23–the Cisco kid has found a permanent home for himself and for his sidekicks. 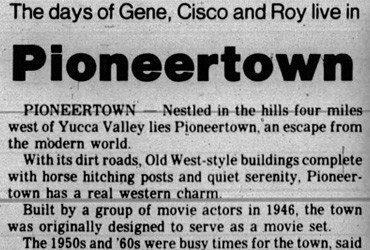 It’s a brand-new community as communities go named Pioneertown, located in the San Bernardino Mountains some 125 miles southeast of Hollywood, and thereby hangs a tale. Founded more than a year ago by some young Californians as a mountain-desert resort, Pioneertown as all the advantages of superb mountain scenery, bracing desert climate and meet on untouched beauty of the region. Since it’s birth, 300 have established residence in the town, opening a hotel, restaurant, corral, western outfitter’s shop, etc., in anticipation of a tourist influx. 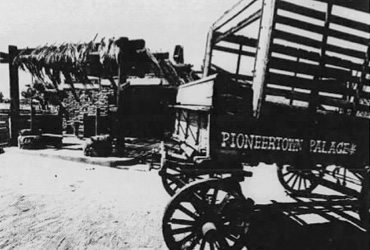 However, and here’s the story, Pioneertown was just sauntering along until Philip N. Krasne, young film producer, visualize the place as a new Hollywood on the desert. After Huddling with the development company to utilize the entire town for the making of hoss operas, Krasne proceeded to make his dream come true. In the past six weeks since he concluded his arrangements. Krasne has everything set for the local business people to provide clothes, horses, make up, Etc. For all the productions. The business people Will put up the shutters or stop all activities that interfere with shooting schedules. The business people appear before the cameras for my scenes and big parts. For the next generation, Pioneertown streets will not be paved. No automobiles or modern vehicles will be allowed in the town. 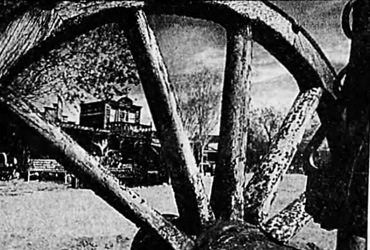 On the positive side, Krasne has built a model sound stage on the outskirts of the town and acquired $350,000 worth of sets from Enterprise studios, which have been set up in the towns open spaces making it the most complete Western movie village in existence. Pioneertown, in other words, is in no danger of becoming a ghost town. Except for fictional movie purposes.